A Rainbow Theme for Preschoolers can be done at any time of the year and these activities can be used to accompany other topics such as Colours, Spring, or Autumn as well as just for fun! I love the idea of being able to use story and song to introduce my Rainbow Theme so I began by reading The Rainbow Fish to the children. If you'd like to buy or peep inside this book just click on the title above. We spent quite a long time talking about the PHSE issues connected to the story. I let the children decide what they thought of the behaviour of the Rainbow Fish and asked them whether they had ever felt like that? Perhaps they had a special toy that they did not like sharing with their friends or perhaps a little friend wasn't very keen to share something of theirs. I asked them if they had ever felt lonely like the Rainbow Fish and how did it make them feel? We then learnt to sing the' Rainbow Song' in order to familiarise ourselves with the colours of the rainbow and tried to remember the order they came in. You can make white roses into rainbow roses by putting them in different coloured water and watching them magically change colour. Some glass jars and patience! Just put some water into the jars.Add a different coloured dye to each one and pop one rose into each jar and see what happens!! After a short time each of the roses should have changed into one of the rainbow colours ------ Hopefully!! 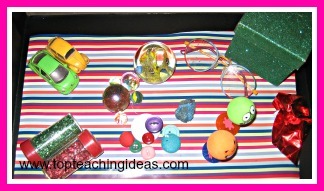 A great rainbow theme activity for preschoolers! 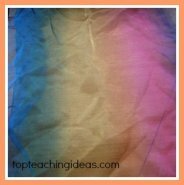 This is an open ended activity where the kids can be as imaginative as they like using coloured chiffon scarves. Give the children box of rainbow coloured scarves and allow them to explore the different activities open to them. 5. Experiment with mixing colours by placing one scarf on top of another to discover how many different shades of colour they can make. 6. Put some music on and let them move and dance in time to the music. 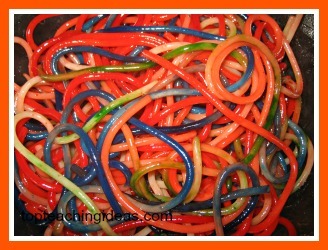 Making rainbow spaghetti as part of your rainbow theme is a must!! It takes a bit of effort on your part but can be saved in a plastic container and used more than once and will probably keep like this foe up to 2 weeks. A saucepan of boiling water. Obviously the prep work is done away from little hands! Firstly, boil a pan ful of water and put the spaghetti in to soften for about 10 mins. When it is cooked ,drain it and rinse in cold water before adding your oil. Mix it well,and then divide it between the 4 bowls. If you want to have a predominance of one colour obviously divide the spaghetti accordingly. Next add the food colouring to each bowl and mix well with your fingers. It does stain so you might want to use latex gloves for this bit! Then you mix it altogether and there you have your rainbow spaghetti for your rainbow theme. I like to put it in several containers so that the kids can have one each but can be used as a communal activity if you wanted to. 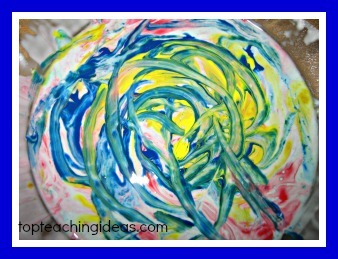 Gloop is a classroom favourite for almost any theme. And if you dare, you can make enough to put in the sand tray on the floor and let them paddle in it without their shoes!! A bit of a risk maybe!? A large packet of cornflour. A large container, big enough for 2 children to use. Firstly, put 2-3 cups of cornflour in your large container and slowly add as much water as it takes to make a gloopy consistancy. You will be surprised at how little you need. Then carefully drop the different coloured food colourings onto the white gloop. You can do this with the kids as they will enjoy watching the colours mingle into each other. Once done , you can let them have a gp at mixing all the colours together to make a great ,gaudy rainbow gloop! I love having a' feely' table in the classroom. I find that the most unlikely children gravitate to it and spend unusually long lengths of time just touching, smelling and looking at its contents. For my rainbow theme table I tried to find a base that was unusual but kept to the rainbow theme. I used some rainbow wrapping paper that I found at home in the back of a cupboard but a chiffon scarf, or several!, would do just as well. In fact ANYTHING that the kids might find interesting.